Even months after the funeral it’s not uncommon to feel just not exactly right. We all lose our way from time to time. Things happen and we can’t find our JOY. It’s not really so much gone, as it is misplaced. Life feels dull and the days seem to drag. 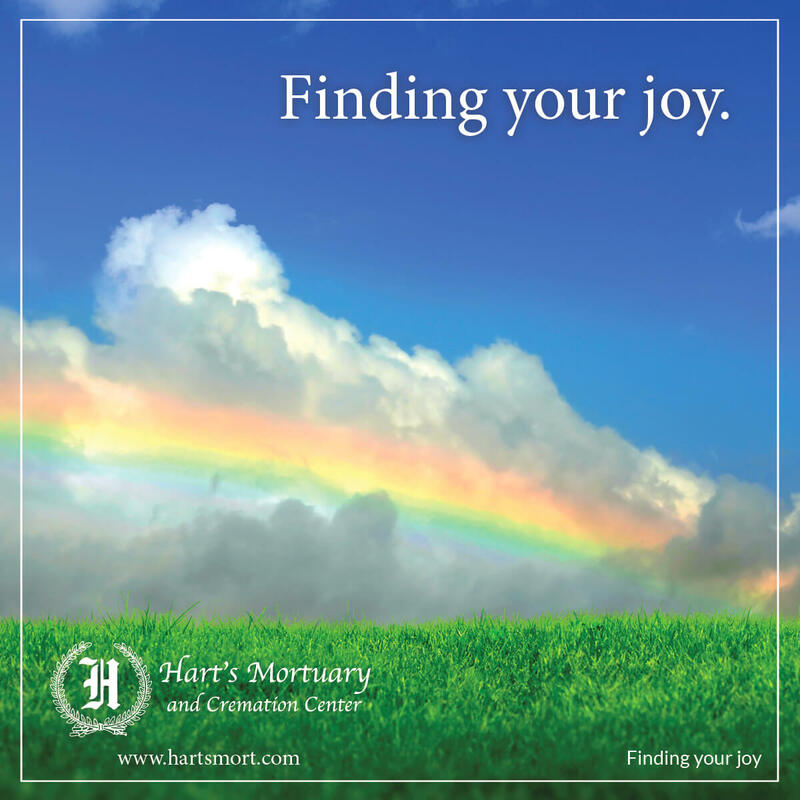 No matter what the circumstances, if you look for it, you can find your own personal JOY again. However, you will have to work a bit to find it and reconnect. To begin, you must put on your little super power cape and take control. You’ll have to take ownership of your joy. Terrible things happen to us in life. Illness of a loved one, your own illness, even the death of a loved one, there really are a lot of things to be unhappy about. You can, however, experience joy in spite of adversity. Make a positive decision to take your personal joy into your own hands and get it back! Start by connecting with your senses, hearing, touch, smell, taste, and sight. Take them one by one and dig in. What sounds bring you joy? Maybe it’s the sound of little kids on the playground, or the Beatles, or waves crashing on the beach. Get out a piece of paper and make a list. You may be surprised at how many little tiny things you enjoy related to your senses. Once you have identified things you like to smell, touch, taste, hear and see, you need to make a plan to get at least one of those things in your life on a daily basis. Turn on the music you love, buy yourself a bouquet of flowers, bake one little chocolate chip cookie every day! What the heck, they make that frozen cookie dough for a reason! Get up early once a week and see the sunrise. Take a walk. Put joy back in your life in its simplest forms. Just go for it. It’s not that hard. Once your senses are starting to wake up again, start to think about gratitude. What are you thankful for? That time your dad took you fishing, that your grandmother taught you the names of all the birds, fireworks on the Fourth of July or the beauty of a tree. The list is endless, humbling, and there is joy in gratitude. Be grateful. It’s YOUR JOY take it back. 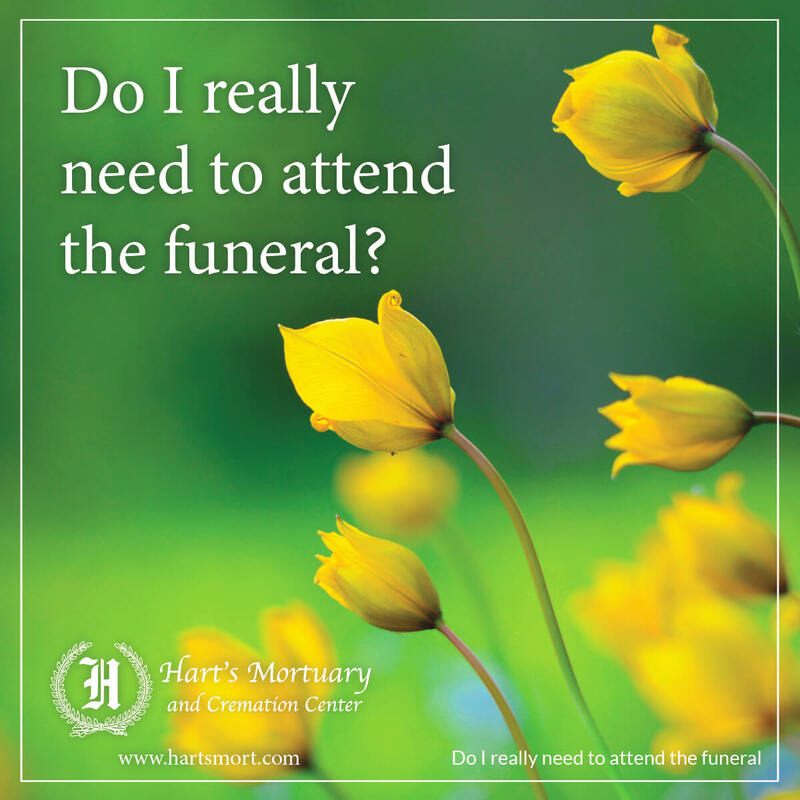 Do I really need to attend the funeral? Your presence is important. If there is any way possible, please, just be there. When a child is born it is a life changing event for the parents, siblings and grandparents at the very least. It may also be a life changing event for the kindergarten teacher five years in the future. Bottom line, life matters. When a life ends, it is also a life-changing event. Regardless of the age at which the person dies or circumstances of the death, lives will change. Family and friends will never see that person again. They will not share in each other’s joy. Neither will they have the opportunity to heal old wounds. They will not hear that voice in praise, love or anger ever again. It’s over, and in some way everyone close will have to adjust to the change. The funeral, the gathering together, acknowledges a living person is gone. Your presence says, “Yes, this life mattered. And, yes, your lives have changed. But not everything has changed, you still have us.” Going is important. The funeral home is a safe place for the family to receive guests and their condolences. It’s ok to cry at the funeral home. In a few weeks when you see this friend of yours who lost her mom, you will want to say something. And when you do, the emotion will open up and the sadness will surface. Crying at the grocery store or the soccer field is uncomfortable for everyone. When people organize a funeral gathering and ask friends and family to come to them to share in their loss and sorrow, to help them. Please go, hold a hand, give a hug, share a memory, offer your condolences, and smile at the video. Let them cry in a safe place. Where Should I Send My Condolences? Condolences do matter and timing is important. Do not put off contacting your friend to express your sympathy. Options and opportunities may have changes over the decades, but the importance of reaching out to those suffering a loss has not. A call or a written note is always just right. Social media is just fine under some circumstances and a personal visit is lovely. Additionally, many funeral homes have a place on their website to post condolences. This format allows your expression of sympathy to be delivered privately and quickly. So, let’s start with the newest trend - technology and social media. It’s so fast and so easy to access. If you are texting a co-worker several times a day about other things, it would seem rude to not mention the loss of her mother. Do use private messaging forms of social media with people you communicate with regularly in this manner. Caution!! Be very careful to not send a public condolence message using social media if your friend has not made an equally public announcement of his or her loss on the same platform. Do follow-up your message with a call or personal note. Finally, do not use electronic messaging if the receiver is not a regular user of tech. Hand written notes or cards made for just this purpose should be mailed to the person closest to the deceased or to a personal friend who has experienced a loss. Your personal note should be simple. Thoughts such as you are sorry for their loss, you are thinking of them in this difficult time or they are in your thoughts and prayers are appropriate. If you knew the deceased, you might share a brief story about the person who died and shares your connection. 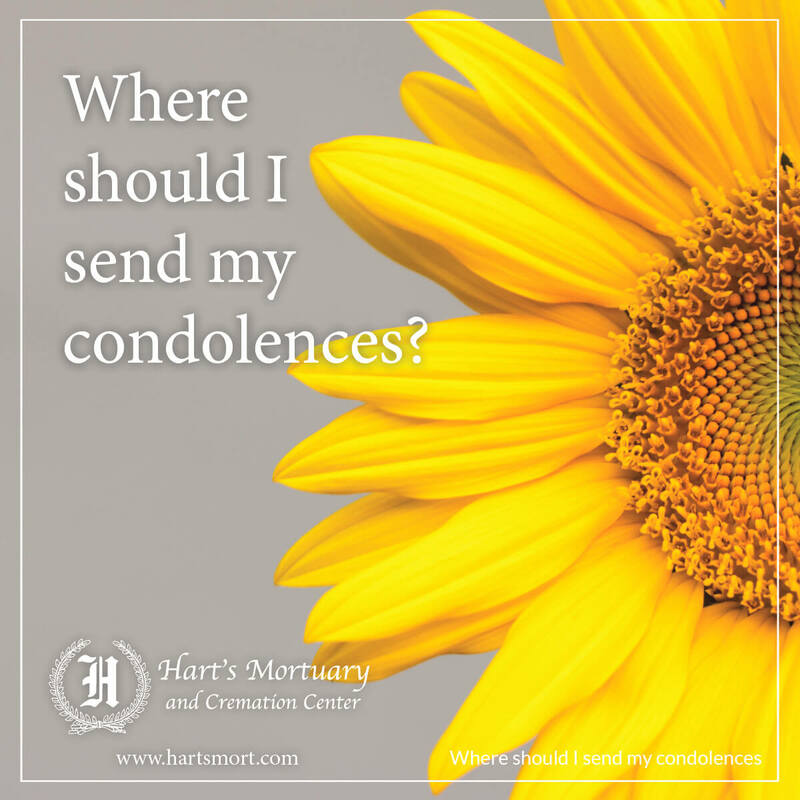 Should you make a condolence visit? Oh, my yes! A personal visit is the only way to give a hug. However, do call ahead. Do keep your visit brief and do focus on the grieving individual. Please, don’t say you know how they feel even if you share a similar experience. There will be a time for sharing later. For now, just let them know you are sorry for their loss. Come as a listener not a problem solver.